On Sunday (February 27) a Western disturbance was passing over Pakistan towards India. The city of Lahore which is called the cultural capital of Pakistan was lashed by a rare hailstorm that left Lahorites shocked, amazed, speechless and some frightened. People enjoyed the weather by actually feeling what is like being lived in a hilly area but some people thought the weird phenomenon as a warning from God that is why they started praying and went to local mosques to pray. It was indeed a shocking phenomenon for Lahorites who had witness such events rarely but this hailstorm was intense and longlived but it was also a isolated event as other parts of Lahore remained dry/partly cloudy. The hailstorm was due to the development of a small supercell thunderstorm, west of city. The temperatures played a important role as ground temperatures were high and air temperatures were quite low that allowed a small isolated supercell thunderstorm to develop over west of the city and move over northeastern parts of the city where it dissipated. The hailstorm carpeted the city with white colour, this hailstorm was the strongest in 35 years and lasted for 30 minutes. Though the quantity of hail could not be recorded. Difference between Hail and Snow? 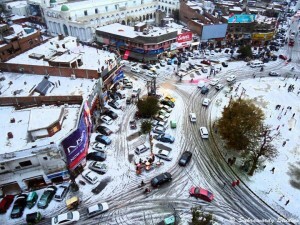 Is it snow or hail in Lahore? Most people think that hail and snow are same but they are totally wrong. 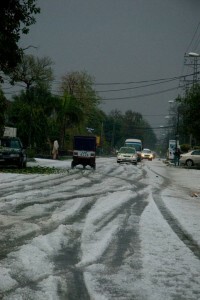 Many Pakistanis believe that snowfall occured in Lahore but infact it was a hailstorm. If we see the above picture it seems as if snowfall occured but it is hail. What is a hailstorm? A hail is like a block of solid ice that are liquid in the air but becomes solid due to low temperatures. Snow on the other hand is watery flakes they occur only when the air near the ground is very cold to below freezing level. Does it hail in Lahore? Yes it does hail in Lahore, these storms occur almost all over the Punjab province of Pakistan but are shortlived unlike the “Lahore Phenomenon”. The plains of Punjab witness 5 to 10 or more hailstorms every month during the winter season and monsoon season. Many people were frightened on February 27 at 4:45pm in Lahore. Lahorites quickly started reciting verses from the Holy Quran and rushed to mosques to offer their prayers and begged for forgiveness from God to ignore their sins but keeping it in mind that the hailstorm was intense, long lasting and an isolated event since other parts of Lahore were dry so was it God’s wrath or not??? excluding 2008 karachi has got abnormal high monsoon rainfall from 2006. Hailstorms can not occur in in coastal Balochistan, Central and Lower Sindh due to high temperatures and mild winters. How can we have a hailstorm in temperatures above freezing point? Surely, for cubes of ice to fall from the sky, the temperature should be below 0 celcius. Snow occurs in below freezing temperatures but hailstorms can not occur in freezing temperatures, even if it does it will become snow..Hail is like a mixture of rain and snow thus it occurs during the combination of low and high temperatures. I have the same question, why can’t there be a hailstorm in Karachi? You need a strong super cell thunderstorm, combination of high and low temperature over ground and air respectively for hail to occur in Karachi. Dry air from Balochistan and Arabian countries kills these factors to develop over Karachi and much of south Pakistan. What needs to change for there to be a hailstorm in karachi? By this I mean, because of global climatic change weather is changing, what needs to change for there to be a hailstorm in karachi? A severe thunderstorm with updrafts and downdrafts that are in near balance, allowing the storm to maintain itself for several hours. Supercells often produce large hail, powerful downpours, very strong winds and sometimes tornadoes. Thankyou. I think i have to read about these on wikipedia, this is complicated stuff, I don’t understand most of it. It was not God’s wrath. Even the flooding of 2010 were not God’s wrath. It is just severe weather conditions. To some people its a wrath of God, to some its beauty of God, to others its normal nature..
People with little knowledge become superstitious. It is simply science. Its a fair point about calling it a wrath of God or simply science. The discussion about this would get fairly philosophical. Discussions about cause and effect always do tend to lead no where. Why is it common to have fog in the winters in Lahore, but not in Karachi? In Lahore, mostly in january there is thick fog, so much so that even driving of cars is not possible. Why doesn’t this happen in Karachi? Will it ever stops rains forecast for NWFP and kashmir due to western disturbance and others? There is no forecast of rain for these provinces for the next few days.. According to Indian Meteorologist there may be some change occur this year monsoon due to japans earthquake. Due to japans earth quake La Nina may occur again and northern India may get more powerful rains and storms then normal so this also means that Northern pakistan and punjab may also get powerful storms and rains like previous years. Is this forecast true or not? I dont think so….there is no direct relationship between weather and earthquake. I will have to agree with Karachi Metro. An earth quake is due to the heating of the earth’s core. The extreme high temperature at the centre of the earth is because earth was once a part of the sun (Big bang thoery and creation of the universe), such high temperature creates steam which can cause the earth’s crust to crack open, hence an earth quake. So an earth quake is not related to the climate at all. Snow cannot occur in Karachi. Hail can occur, it did occur this year.